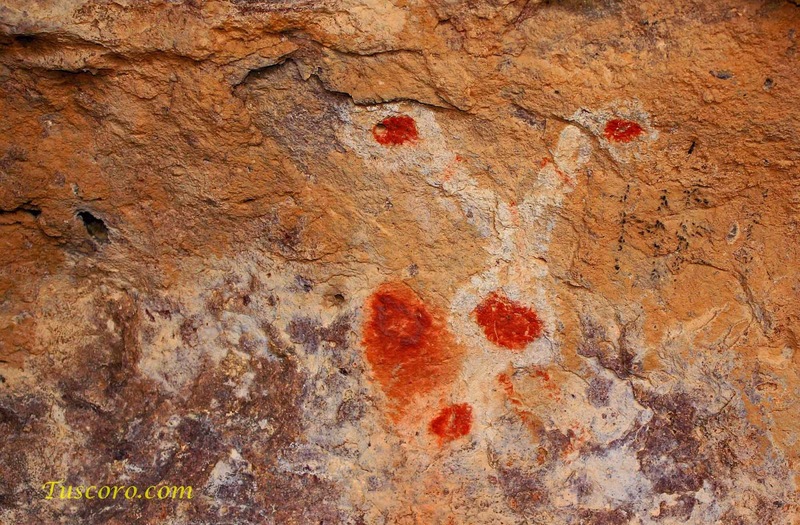 Now Lions Mouth glyph site is a long way from the following story, but I place this story here as Lions Mouth is similar to the appearance of glyphs that were found long ago in a cave, found by blasting the end of the mountain away... Yet Lions Mouth Glyphs is a small drop in the bucket as to what the cave in the following had. In the mid to late 1960's when I was just a wee whipper snapper, my friends father and future scout master was working on the I-80 road project to Wendover from Salt Lake City. Just one mile east of the Skull Valley turn off, he recalls one day a dynomite blast trimming of the end of the mountain to make way for the new super highway... as the dust cleared one of the men working the site hollered out "there is a cave here!" 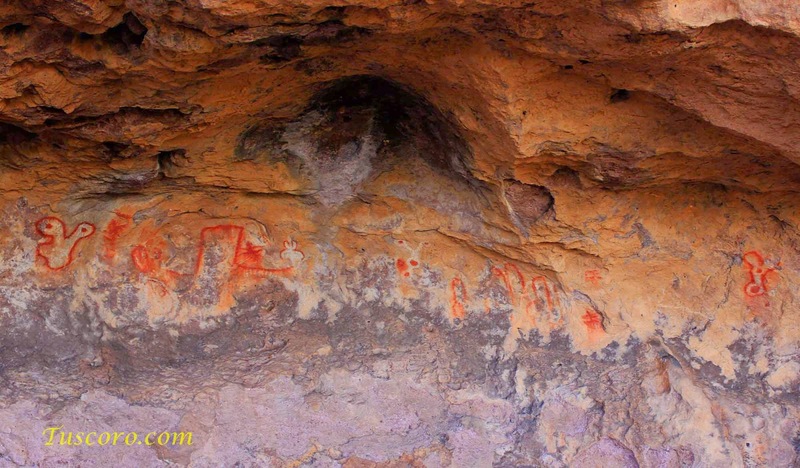 A few of the workers went to investigate and according to my friends father now in his 70's, he said there was a cave that was covered with pictographs, some of the most elaborate he had ever seen and he has seen many in his day. 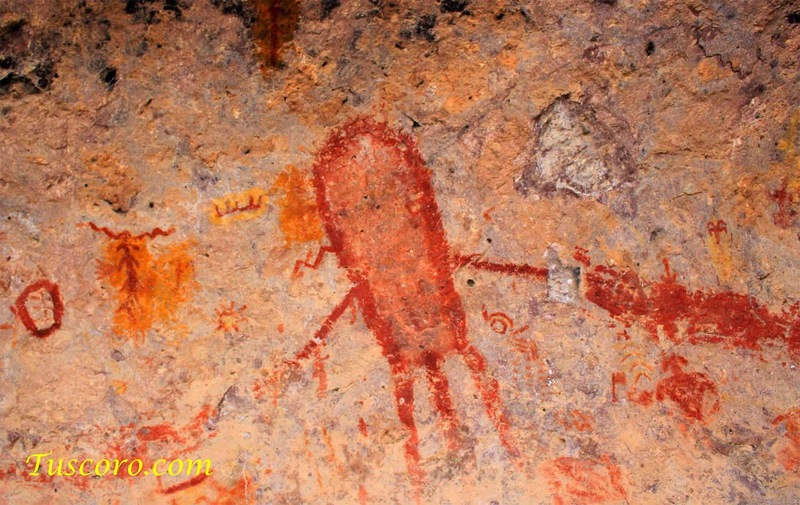 To his knowledge nothing was done to document or photographs the paintings and a few more charges were set which sent the remainder of the cave and pictographs to eternal oblivion... I hope that he is wrong and I hope someone did something to preserve the ancient history that was likely preserved in the paintings. 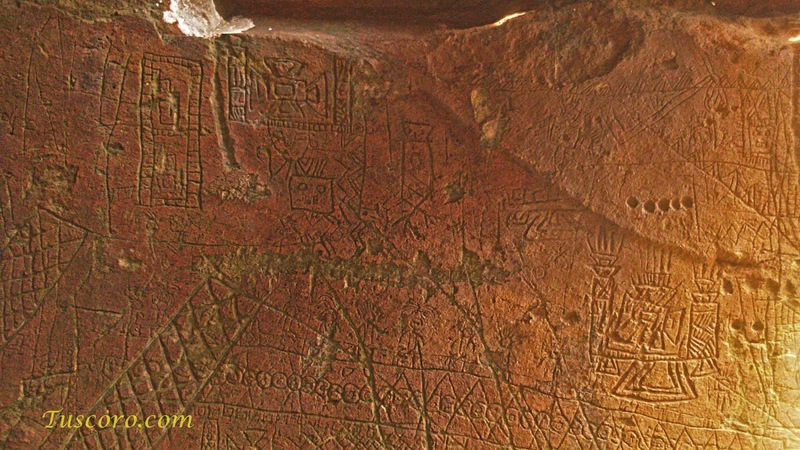 If anyone has any information as to whether these pictographs were documented, I would certainly like to know. I do not know how to discover the answer as no one, even after all these years is going to admit to anything. Strange Glyph site and location Indeed! 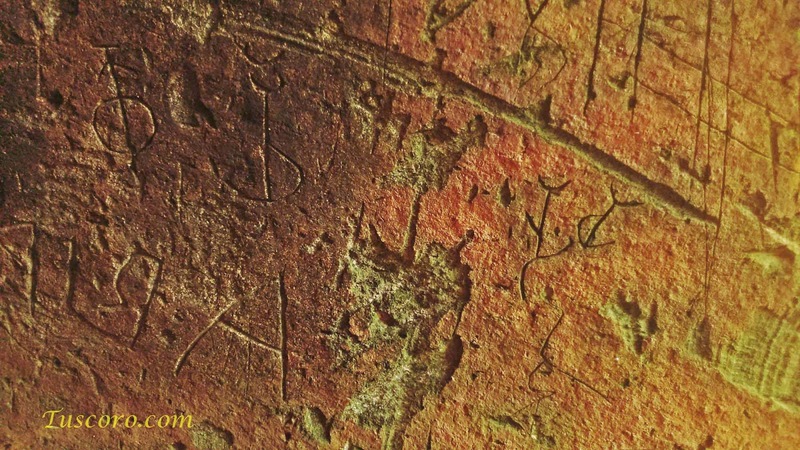 A friend sent me these pictures of some very strange glyphs, I cannot answer any questions regarding location, but I can say they were found near the top of a silent volcano, in a crevice, a crevice which almost looks like it was an entrance at one time and if so, it is badly caved.... I know it is difficult to form opinions without a general location, but that is not possible at this time.... regardless any thoughts? If nothing more, Enjoy! After evaluating the previous glyph in PART FIVE I was puzzled, I couldn't understand why these instructions were given. After following the trail or locator glyphs from the first panel now 1/2 mile away, I found my self wondering why are they're here? What is this all leading to? How do I find this tree as there are so many? Just then I looked a little closer and up and to the left, and there was the glyphs to, in part answer that question. Ah, I thought, there is the subject and what I was looking for, and the instructions as to how to find it. I cannot explain the rush that overcomes you when you feel you understand what the author is talking about in any panel. Keep in mind, it seems that never is it as easy as it may seem here in this example to read the glyphs, even at this early date of my studies, it just so happens that many of these symbols I was quite familiar with, even 25 plus years ago. Even at this early point in time, I had already worn out one of LaVans books and was well into wearing out my second. Today I rarely even look at the book. There is a man made object, made to hold some thing. From this (side) or outcrop, turn left and go down. over the ledges, through the wash (Gully, Rock Incorporation)) to here. After a little trial and error in figuring out what was being said, I cleared my head and went over it again carefully, this time I looked in the direction intended, and spotted what I thought was the tree in question some 60 yards away. It would be another dozen or more visits to this place before I discovered the right tree intended, just 12 yards uphill. Keep in mind, at this time I had not understood exactly what was being said about the tree being cut off in the middle. This would not be understood until one day quite frustrated as I knew I was in the right place, I parted the branches of the correct tree and my jaw dropped as I realized that portion of the panel seeing it had been cut. I recall at that moment saying, "now if I could only find that last glyph that I know is here... at that moment the Swiss exchange student that was with us that day, pointed at the rock I was sitting on examining the tree and said, whats that pointing at the very glyph I had looked for for so long. The man made portion of the translation is arrived at by the incorporation of the center of the circle in being squared off, (b.) yet remaining with rounded corners. This indicates it was made for this purpose. 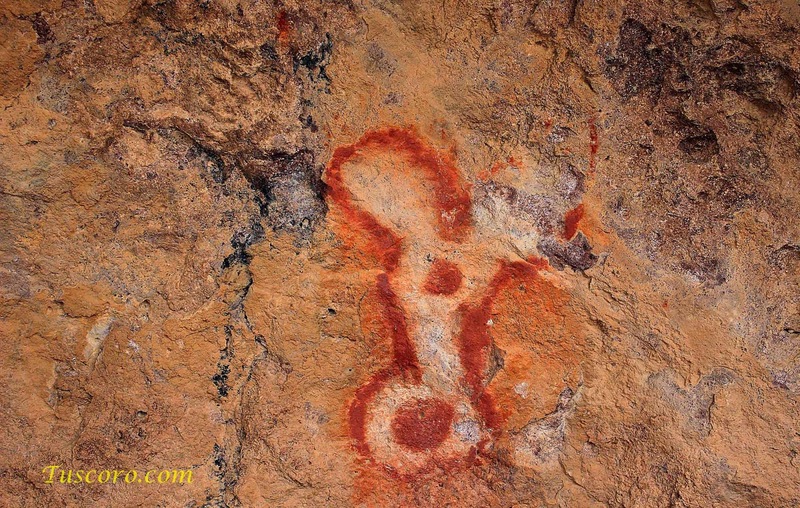 The remaining group of glyphs are among the first glyphs I had learned and are what we call locator glyphs. c. is the symbol in this case for turn and go down, it can by itself also mean turn and go right, but because it was attached or touching the symbol d. (Side) this brings in the meaning of From. Had it been detached as is the dot at the end of the trail symbol, with the dot, it would have read turn and go right TO this side. The symbol e. (Steps) or the intended meaning, ledges, further clarifies the previous where in From is again intended, so at this point we have, From this side or outcrop, turn left and go down over the ledges. 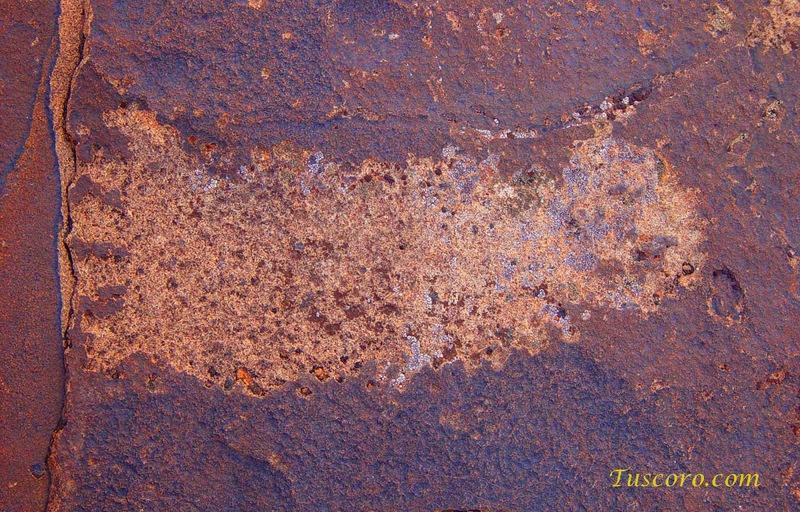 f. is the only form present and used at this site of what is called Rock Incorporation and is a natural gouge in the rock and its intended incorporated meaning is that you will be crossing some form of gully, wash or the like. g. is a combination of two glyphs, the remainder of the glyph (line) not shown in the charts specifically with the meaning of trail or path and TO the detached (dot) symbol meaning here or in some cases one. I hope this little treatise of 6 parts was enough to convince you of the probability of the Native American Glyph as having strong possibilities of being a written hieroglyphic form of communication. 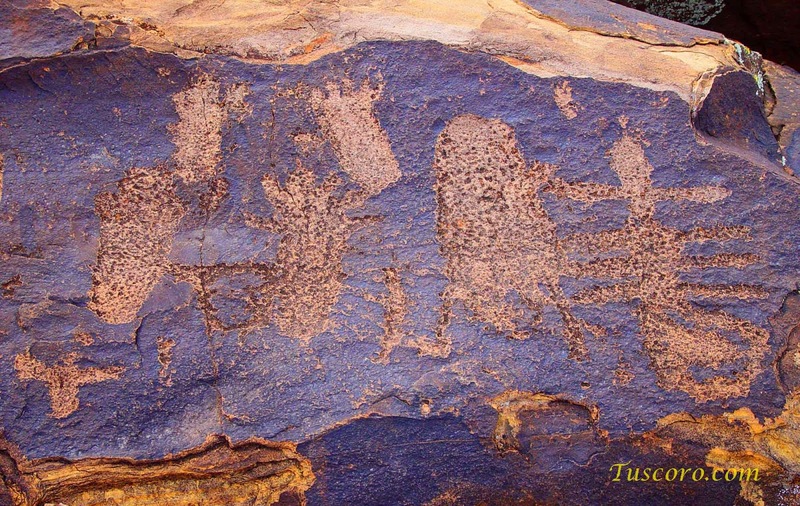 At least to a degree of curiosity to choose to further investigate the Native American Petroglyph and Pictographs. 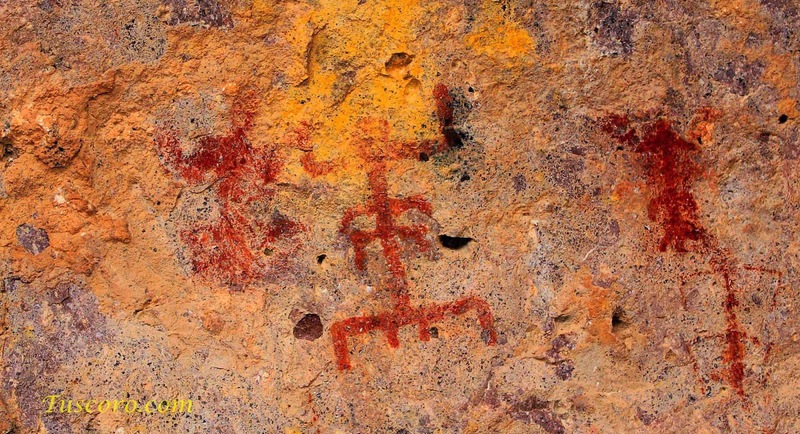 If you should choose more to understand LaVan Maritineau's hypothesis of the Native American Glyphs as a written language, seek out a copy of his book, The Rocks Begin to Speak. You may also learn more about it in chapter 16 of the Book Nephite North of which much of the previous information comes from, and is at this time only available in pdf format. To get your copy please email me at tuscoro@gmail.com. "In the two following images I am going to give you the translation as simple as it needs to be, the message from the past as to what message was intended by them, and later in this progressive report, I will demonstrate a "breakdown" of the glyphs and explain why I have given the meaning I have..."
Well that time has come and in the following I will now perform the breakdown to help you better understand this process and hopefully give you a better understanding of the Native American Petroglyphs and to better support in your mind as to the possibilities of the Native glyphs as a true written language. "There is a tree growing upon a rock and covering it, the tree has been cut off in the middle with two remaining branches which spread wide. The rock it grows upon is a part of a cavern, All of this is hard to see." 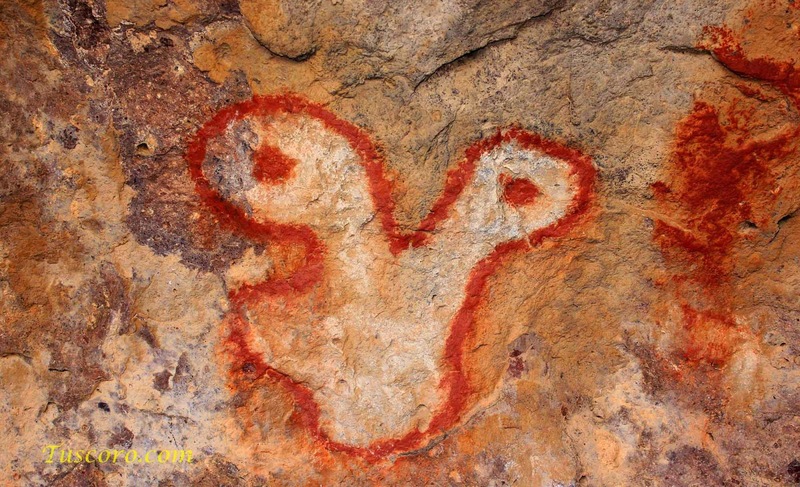 "Hidden, Tree on Rock covering, cut off in middle, rock part of Cavern, right side open near end." Even that may not be entirely accurate as the learning process never seems to end. 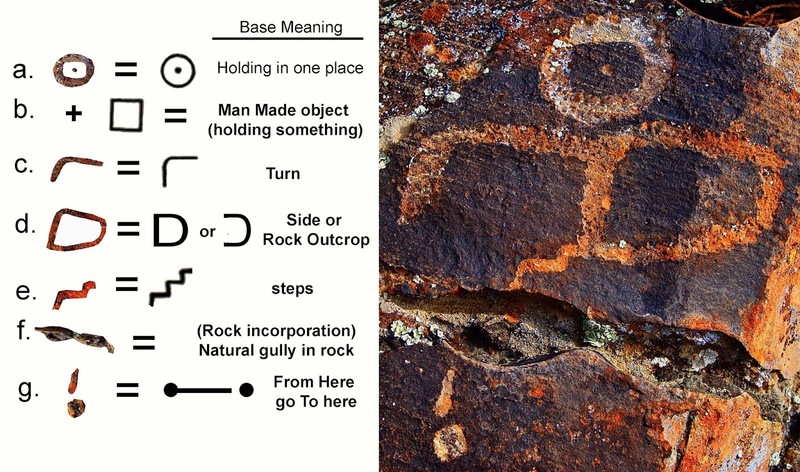 With this said lets look at the image below showing the breakdown of symbols perceived or viewed withing the glyph itself be it symbol combinations, symbol incorporation or what is referred to as "rock incorporation where in the features of the rock the glyphs are on, are incorporated to give added meaning. For examples of Rock Incorporation see page 201 Index of The Rocks Begin to Speak. For a Larger Image, click the picture. 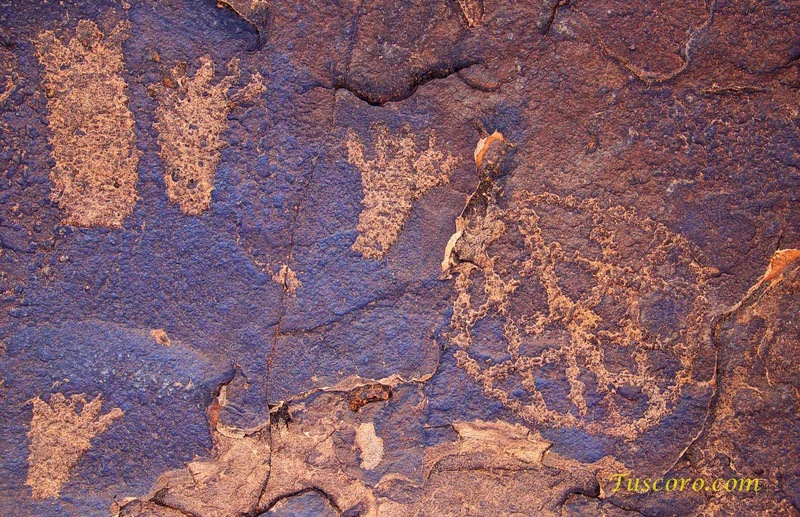 Beginning with a. we have hidden, in most cases when a symbol is located above separate from the main glyphs, it usually represents the subject OR has to do with the entire subject, in this case it does not represent the subject but is simply meaning, All of this is hard to see, THIS being the main body or subject of this panel. b. means wooden object and in this case a tree, the symbol is incorporated into the main body of the glyph which in fact looks some what like a tree on a rock, something which I have noticed over the years is the ability of the Natives to cause the glyph in many causes to actually look like the thing they are talking about, at the same time using the symbols and combining them to say the same thing. c. is the incorporation of, off, of the top to indicate the tree being cut off in the middle. It to being ingeniously incorporated into what would be the main body of the tree and branches. d. evaded my understanding for some time as it seemed repetitive, however I believe it was added here to convey or clarify the message of the branches are what is covering everything and making it all hard to see or hidden of which it was indeed when we located it. It was not until the branches were pulled back that one could see the tree had been cut off. e. is understandable enough, clarifying the tree on top of the rock, however the incorporation of f. to veer still evades my understanding as to why it was included. 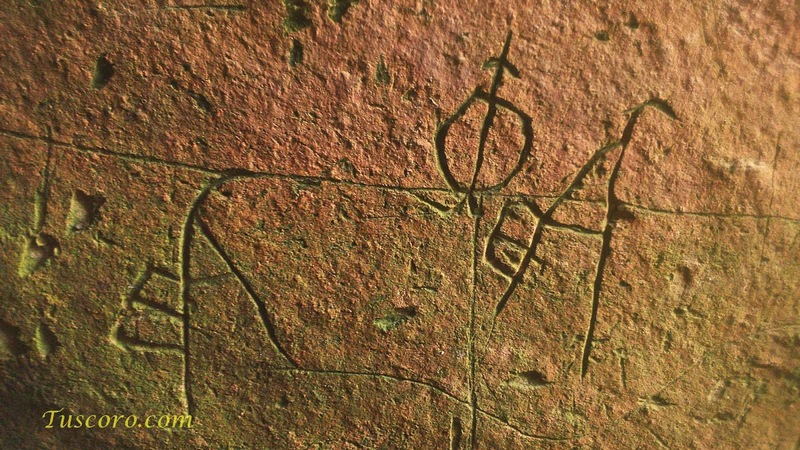 g. and h. were clearly representation of the outcrop or rock in which the tree grew, and one would actually have to see for themselves the uncanny scene which has been captured in the glyph, so much so, it left no doubt. i. Over the years I have discovered that when ever ANY line symbol makes a complete loop and coming back to itself, regardless of its shape and especially when the shape itself does not seem to match any particular known symbol, that the meaning of holding is present, and what you are looking at, is more than likely a geological feature as is the case here, and it is a beautiful rendition of the rock outcrop itself. But why is holding include? j. may be insignificant other than without it, it would not accurately describe what was being looked for and if it had not been present and I had not found the final glyph with final instructions, I would have questioned the meaning. The Following is Copyright Material. however it is badly overgrown and difficult to find, the above image is enhanced for viewing. UNLESS it was actually intended to represent a particular animal, what is often referred to as, Mountain Goats, Dear or Elk has NOTHING to do with ANY animal. How do you know the difference? 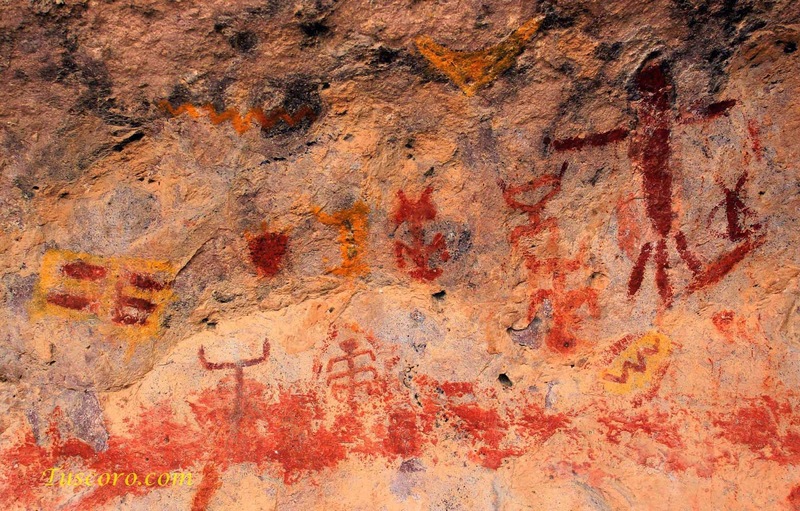 The Native American is very well known for their keen eye and ability to capture the majority of the details when recreating some thing, in short, they are known as some of the best artists on the planet. If it were meant to represent a specific animal, it will look like it WITHOUT the stretch of the imagination often applied. 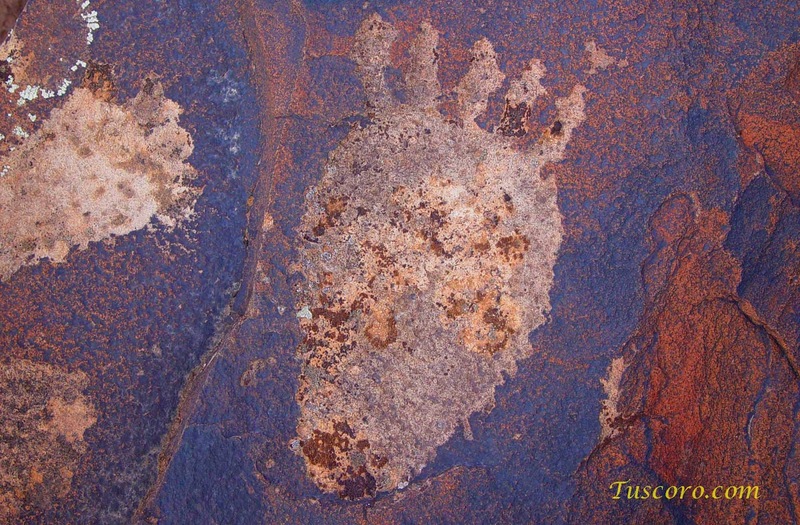 This little critters appearance at almost every petroglyph site has caused more misunderstanding that any other glyph and because of superficial viewing, or the unwillingness to investigate, we end up with pure conjecture. An example of this might be had concerning what has been termed as the “Great Hunt Panel” due to superficial viewing and as a result of two things in the panel which “Obviously” has to do with hunting. 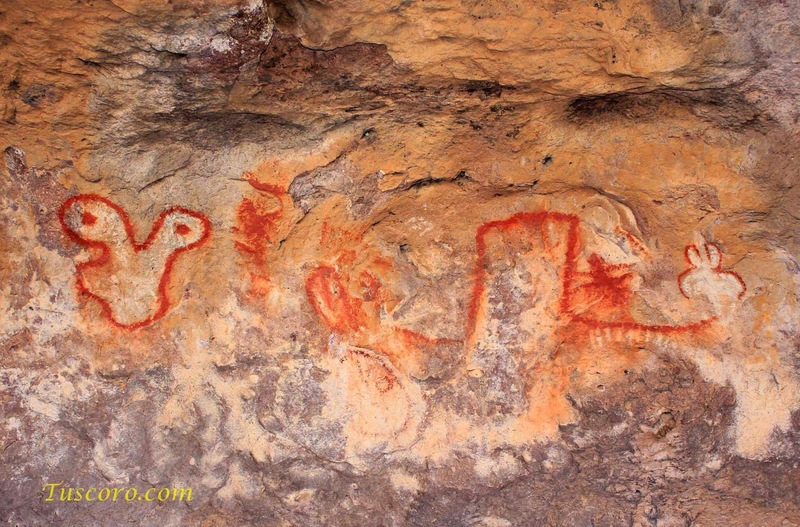 The appearance of what seems to be a man holding a bow, and a high frequency of some animal looking like a sort of Deer, however this panel has absolutely nothing to do with the hunting of animals. This fictitious animal was created for the sole purpose of conveying “Lateral Movement” and this is why it appears in high frequency world wide. 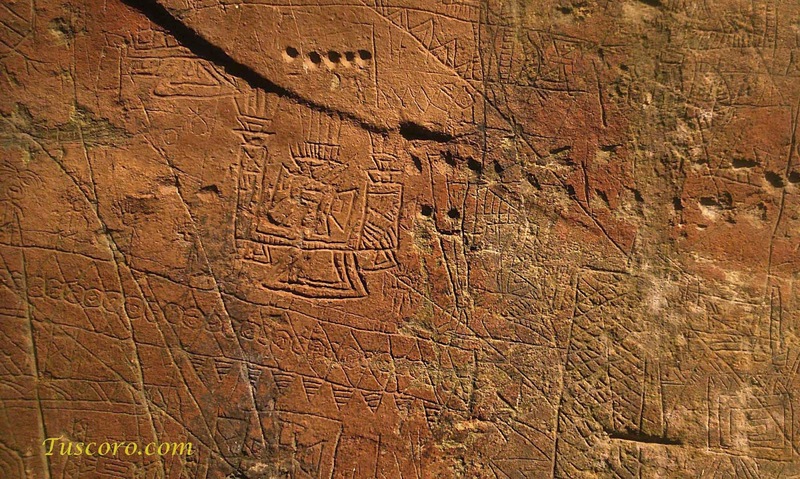 In most panels it will be associated with what we have come to identify as "Locator Glyphs." 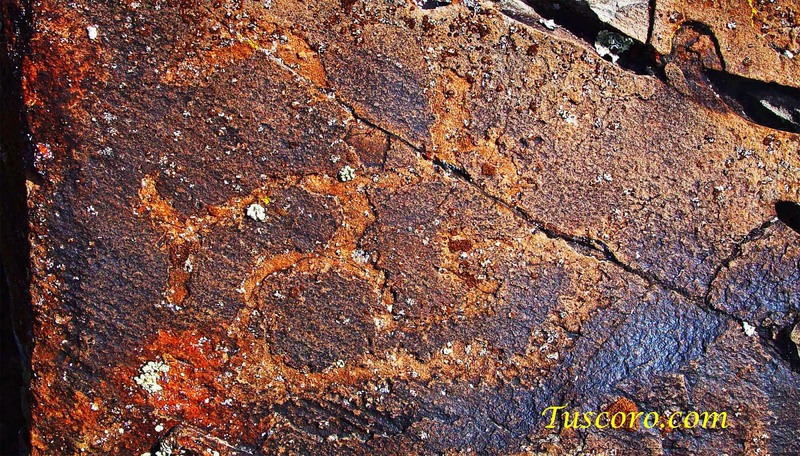 For more understanding, see The Rocks Begin to Speak pg 3 and pg 47. The breakdown is exactly what it sounds like; it is the process by which a panel is dissected into its single independent symbols in order to identify them, to give a clearer picture in order to attribute the base meanings to the many symbols. A chart is made of all the symbols found. The best way I can think to explain the breakdown is of course demonstration of which I will give an example in the end, however, in my research I am faced often with very old hand written documents which are always in cursive. Many are tattered, torn and in shaky hand writing, I often find myself systematically segregating the many easier identifiable words, in order to discover what they may be by comparison to those which are not so obscure and compare the letters in each of them in order to find the intended often not so easy to identify word. 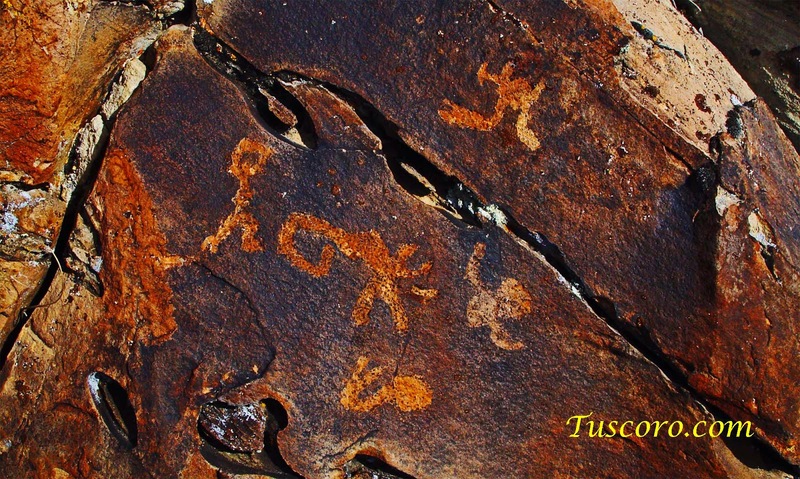 With the Native American Glyphs it is much like receiving an old hand written document of some foreign language using the alphabet. The difference is, In the Native Glyphs we only have part of the alphabet, with barely understood application of rules and or applicable principles. 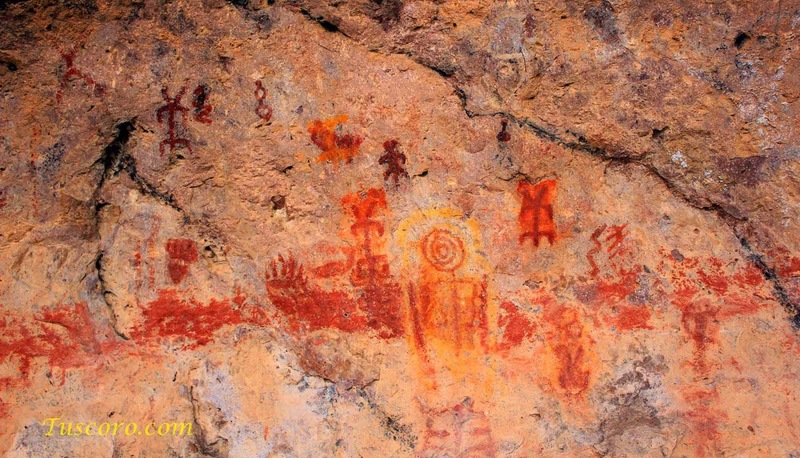 Identifying the many single symbols used, in the end makes it possible to discover the subject of the panel, but most important, the potential meaning of the panel. I have already expressed my opinion as to when and where this all started, and this would explain why it has spread to virtually every continent of the world and seems to retain the same meaning with some slight deviations. But how did this glyph system get here to the Americas? I believe that shortly after the confusion of tongues and in about 2400 BC, a family of the descendants of Japheth left the location of the Tower Babylon, then migrated to the regions of today’s east coast China, these are the people who would eventually became the fathers and mothers of all Asian people and at this time the closest living relative would be the Altai Mongolian and on this continent after much intermixing would be the Inuit, Navajo and Hopi (but not limited to). Not long after they arrived in the area of eastern China, a group of them broke away and sailed into their eastern sea arriving some time later at or near today’s California coast. 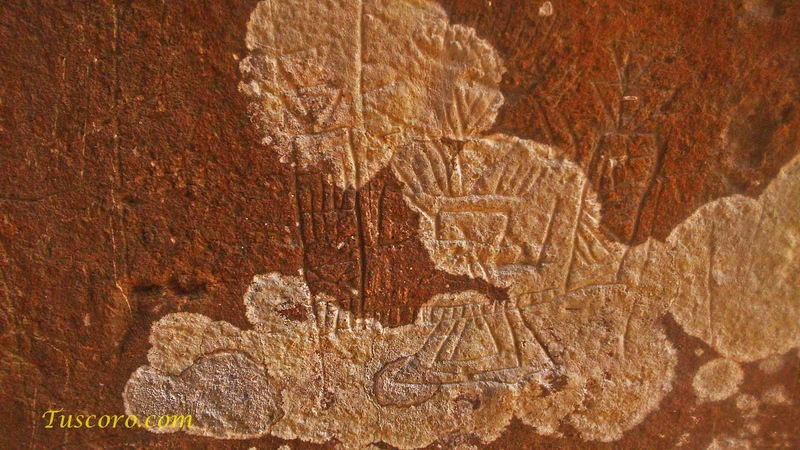 Whether these people brought this symbol based system of hieroglyphs that we know as Native American Petroglyphs, is unknown. It does not make sense that they would bring it with them as according to what we might consider as our scriptures, they retained the original language both spoken and written and to this day, examples are found from east to west but is often suppressed. It is likely that some unknown group came to this continent, at a later date, bringing it with them. If so, they would have had a need for it to communicate with those who had come here around 2400 BC. It is more likely, however, that after this people had nearly annihilated themselves due to a civil war with few remaining and with this occurring about 650 BC, that another group brought this system of symbols with them with these people being of Hebrew Origin according to DNA studies and who arrived according to many sources on our eastern coast near the Delmarva Peninsula about 600 BC and at near the same time another who sailed up the Mississippi and establishing themselves. 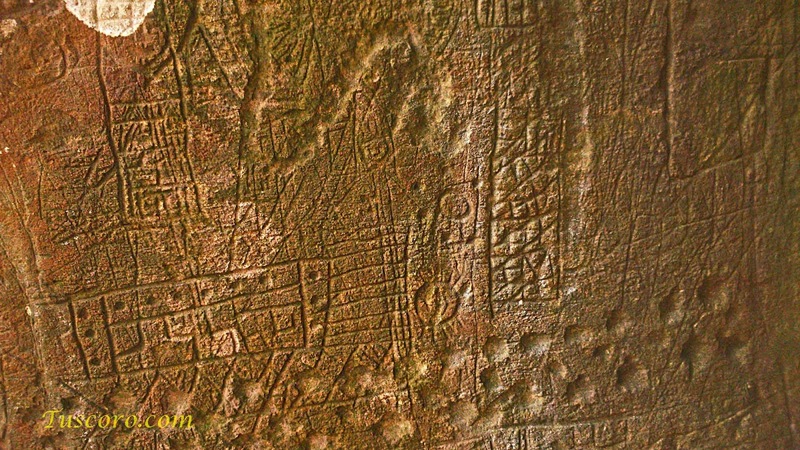 Another group documented by the Aztec with the specific date given of 635 BC, said to have landed on the northern tip of the Yucatan peninsula. 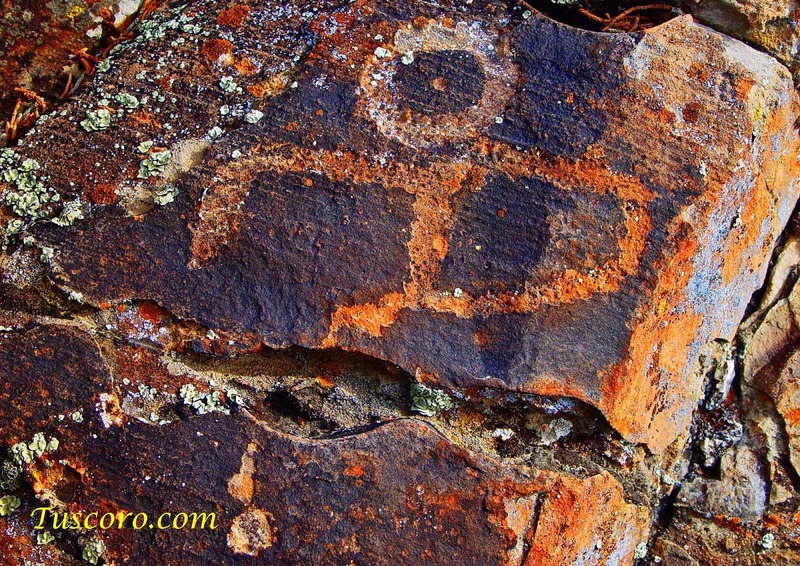 Most Archaeologists today do not recognize The Native American Petroglyph as a writing system. They see it as doodling, hunting magic or meaningless scribbling, I’ve heard it all from their own mouths. 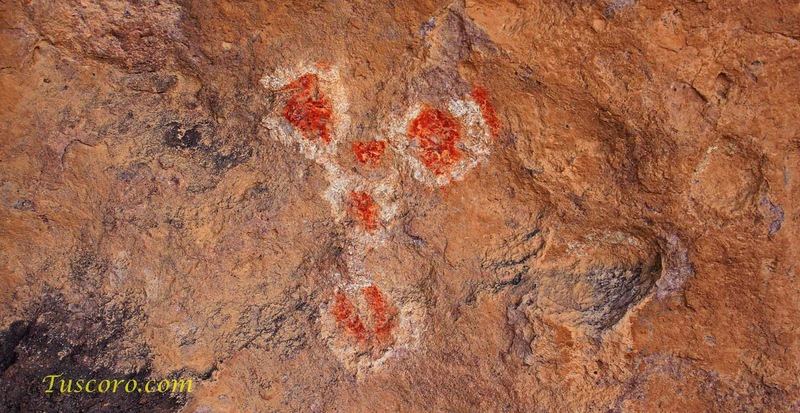 At the same time they attribute style to them such as Fremont style, Vernal style and Anasazi style. This, in and of itself makes no sense. Are they saying it a Meaningless Scribbling Style? What is it they are trying to say or not say? 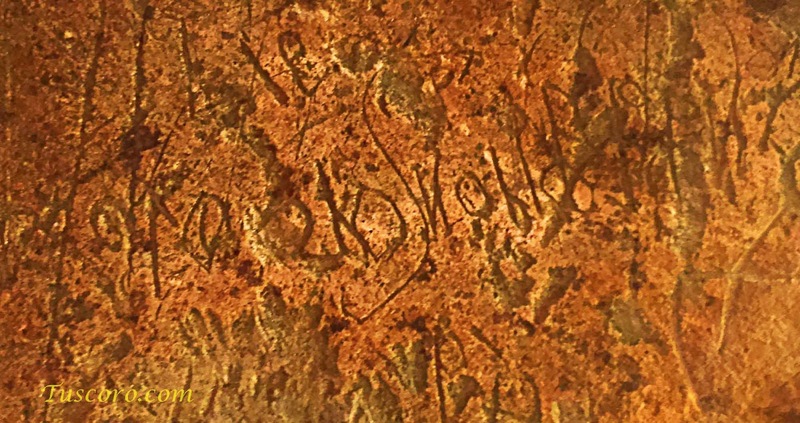 If the scribbling conveys ANY kind of a message whatsoever, then it is a writing system. This is what is referred to as a symbol combination and/or symbol incorporation. 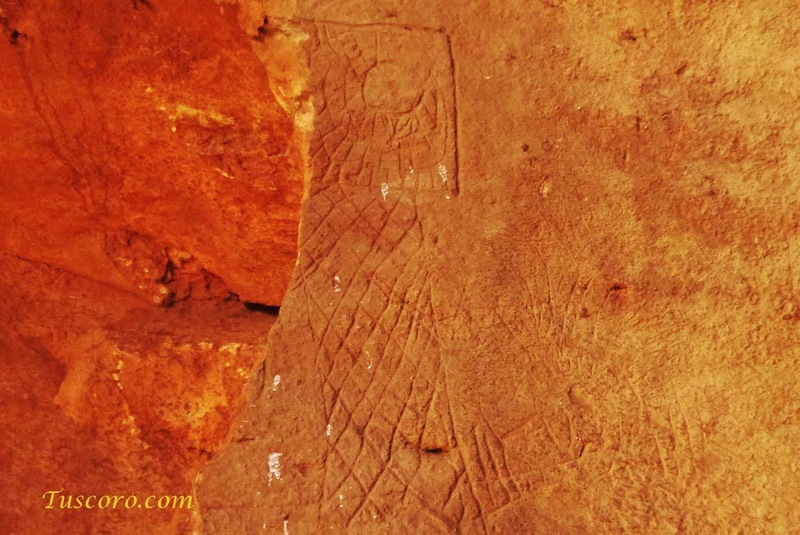 A Hieroglyph or Character is NOT a symbol. Many would call this a symbol and it is often viewed as a symbol which they assume has a one word meaning, when in fact a Hieroglyph or Character is a combination of symbols to express some Extended concept, action or idea of the symbols that make up the character. In the same way you would add to a sentence using the English words such as The Red House you have used 3 words of which house and red would represent single symbols, but if you wanted to be more descriptive you would add more words such as The Big Red House or if you wanted to expand upon this idea it may be something like The big Red House on the Hill and so on, this is exactly how symbol combinations work. 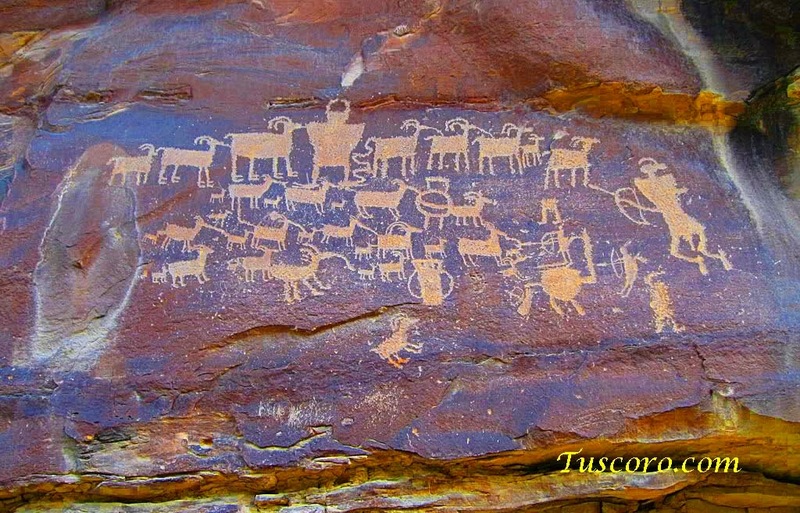 Each Hieroglyph or Character used whether it is of the Mystery Glyphs, Wallum Olum, Egyptian Glyphs or the Ojibwa Glyphs is designed to express a specific idea According to their manner of speech. 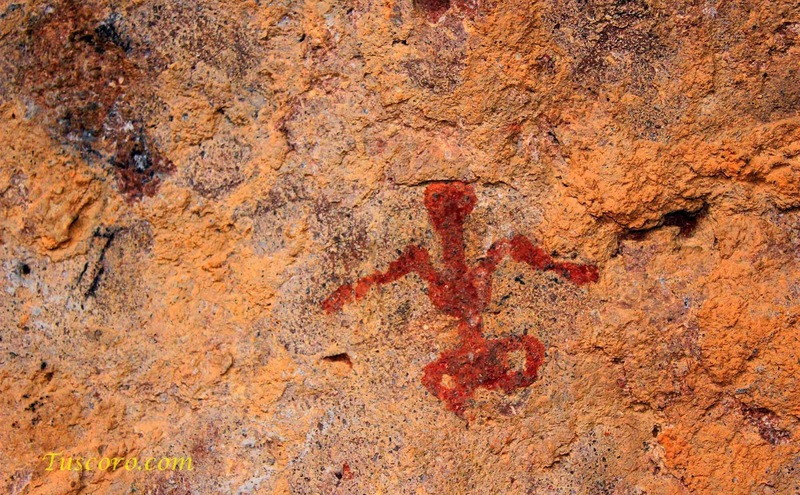 This is the very reason why some of the Mystery Glyphs may not be exactly the same as the Ojibwa Glyph because a slightly different concept, action or idea is being expressed or the two are from two similar but different speaking language groups and do not share the same meaning in a specific word. The most likely solution as to why they are and not all identical is that you are comparing apples to oranges in that you are comparing two seemingly like symbols used by both groups but you are comparing The Big Red House to The Big Round Red House or to The Big Scarlet House or The Blue House OR, the subject of the panel is similar but different enough to warrant a different derivative word other than the assigned base meaning word for that symbol. Also, not all languages have interchanging words which perfectly describes the other. Another example of this would be from Tomkins' book and the Ojibwa Character that he says means Morning. You will notice that he has two other glyphs; one meaning Noon and one meaning Evening. Are these symbols the same? Are these symbols? 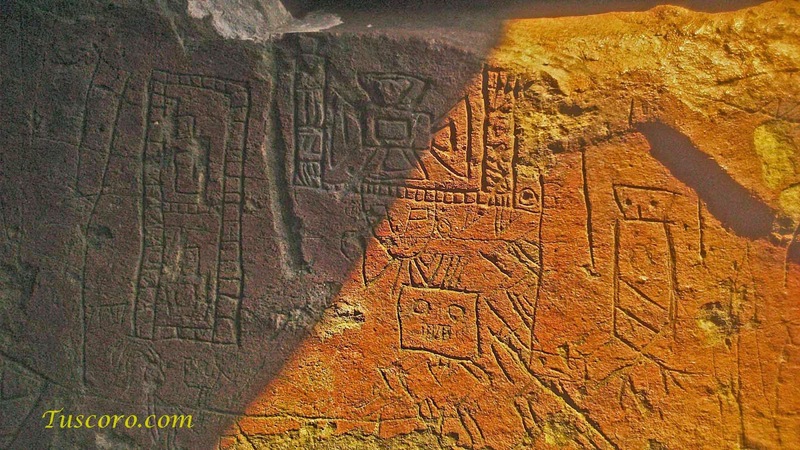 No they are not symbols, they are Hieroglyphs or Characters and no, even though it is the same concept or idea showing the positioning of the sun, they are not the same because some variable in the concept is different. This is pointed out because some would say that the Ojibwa Glyphs are not exactly the same as the Mystery Glyphs or visa versa and are only similar. I would say that is because we have yet to see ALL of the possible combinations of the symbols that make them up. This would be like someone who had never seen the English language supposing that, because they had identified 250 phrases using English words, they now understood the English language. We do not have to point out the hundreds of thousands of combinations of English words to form different phrases. The glyph we see as Morning using the symbol of Hidden or Covering as the sky and the short line placed at the suns position at the location of Morning, Noon and Evening which comes from the symbol, On Top being a symbol looking like an upside down capitol T. this is also an extension of the meaning Holding Firm or Having to do with which is a sideways capitol T. These two symbols COMBINED give us the Glyph for Morning, Noon and Evening by virtue of the positioning or placement of the upside down T. This you will find is the same in all of the discussed writing systems differing only in a application, style of writing or none at all. In one more example in which some would say that they are similar but not identical is the symbol found in the mystery glyphs. 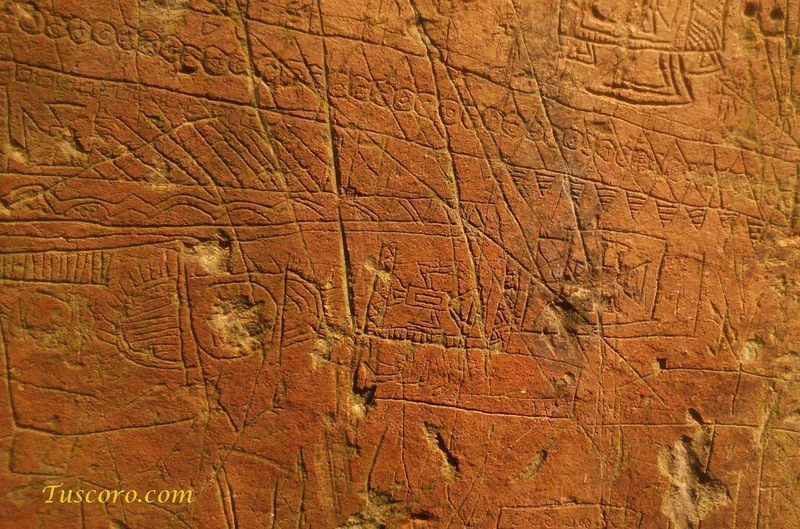 Are these two hieroglyphs identical? Many would say they are the same yet the answer is NO they are not, yet it would seem quite obvious that they share a common root. The biggest difference that I see is probably not what you would see. The difference which matters most to me is the lines surrounding the circle which forms the head. 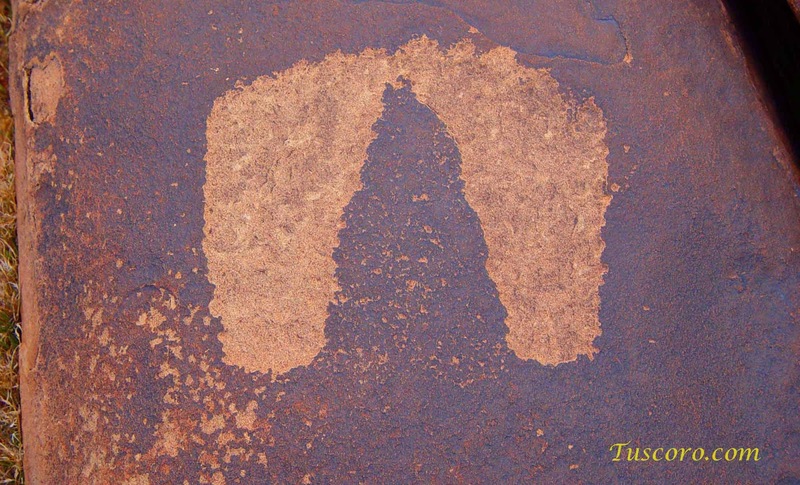 In the Mystery Glyph the lines touch the head and in the Ojibwa Glyph they do not, why? Let’s look at a little rule I discovered many years ago through much trial and error and application of this rule. I won’t bore you with how I discovered this and further more I wouldn’t expect you to believe it. But in short the best way to explain it is by using the Gone symbol which is actually two symbols together and technically it is a Hieroglyph, Character or a combination of symbols. Wherever movement or locater symbols are used with the line (Trail or Path) attached to another symbol; this means From and where it leads but is not attached means To. Symbol Incorporation is very much like a symbol combinations except that rather than one symbol being attached to another or being added to the overall glyph, a single symbol may take upon the characteristics of another symbol, thereby creating what might be viewed as a new symbol or character. The chart below, created by LaVan Martineau, is the best example of the differences between Symbol Combinations and Symbol Incorporations. Keep in mind that once two symbols are put together by combination or incorporation it becomes a hieroglyph or character. The examples shown above are found on page 14 of LaVan’s book. We see in column A, the symbol combinations, and in column B, the symbols that make them up. In column C are the symbol incorporations, while in column D, the symbols that make them up. If you take a good look at any of the Glyphs whether they are Egyptian, Mystery Glyph, Ojibwa or the Wallum Olum, you will find examples of this; Column A and C are Characters NOT symbols. The Symbol Base Meaning is a word meaning attributed to a single symbol, but it is NOT its absolute meaning, it is general. Largely this exists due to the differences in Language. We may not have an exact word which describes a symbol used by those who created the symbol. Depending upon the subject of the panel, a proper or best fitting derivative word of the base meaning word must be identified and most certainly will vary from panel to panel never loosing its base meaning. An example would be in the Symbol known as a simple circle, the base meaning would be Holding, yet many meanings can be attributed to just this one symbol depending on the subject of the panel. It can mean Camp, Lake, Sky, Cave, or even infinity, anything that holds something. The word infinity is added simply because the circle is actually an extension of the symbol which carries the base meaning of Go which is just a straight line, which can also mean Trail, Path or Path of Life. By bringing the line full circle, infinity is accomplished. However, I have yet to see this symbol meaning infinity in any panel. The point is that you need to find the best word or set of words that fit the subject. The Subject of the panel is self explanatory, it is what the panel is about, and knowing or discovering the subject can make the task of translating much easier in finding the proper derivative word of the Base Meaning. 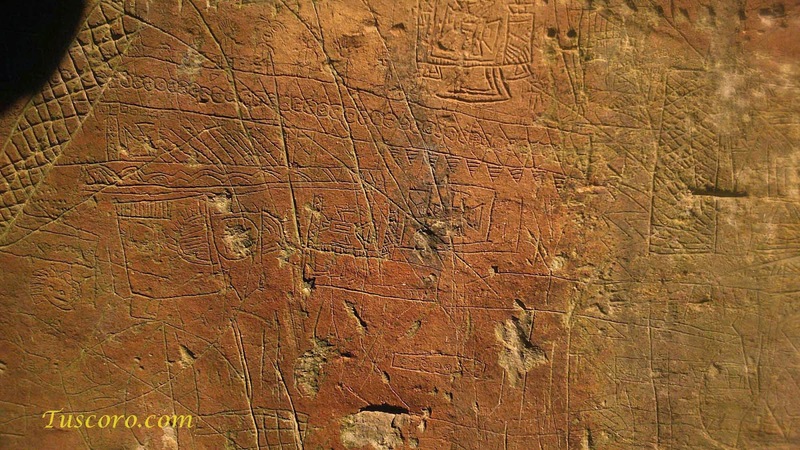 Discovering the subject can be easy or very difficult, study of the ways of the ancients is a must, their beliefs, study of the area in which the glyphs was found is often very helpful in discovering the subject, and there is another little trick as well which I will withhold at this time. Remember, at the end of this treatise which will be several parts, I will give and explanation of the first two photos found in the first part, in the form of what I have come to call a "breakdown" of the panel or glyphs. 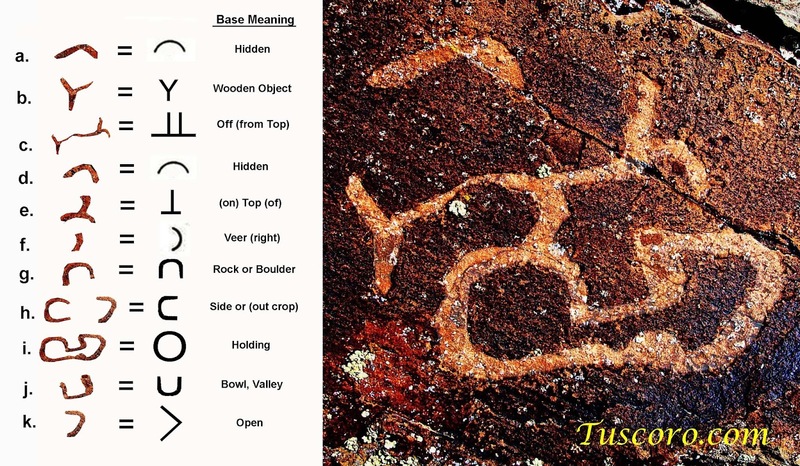 In the course of teaching the principles of LaVan Martineau pertaining to what is commonly referred to as the Native American Petroglyph, many misunderstandings have come up, many questions as to different forms of hieroglyphs found here in North America regarding a relationship with the former, but are they really so different? If you do not approach this with an open mind you will receive no benefit. PROVE ME WRONG; I invite it, but don’t just throw me questions of which the answer cannot be understood if you do not understand where my answer comes from. How many times have you found yourself trying to answer some Religious question of which you know is perfectly understood by those who have read the book, but can’t seem to convey the same message with results, to someone who refuses to read the book from which the question and the answer derives? How many times have you received the answer Oh I’ve read the book with this supposing to satisfy you in why you are wrong when you know that not only have you read the book, studied it, applied the principles in the field and proved them, but have done this numerous times over the years? The purpose of this part is in an effort to shed some light on the subject and clarify many of the things of which I feel I have failed to explain in previous attempts. A simple one time reading of LaVan Martineau’s book The Rocks Begin to Speak is NOT sufficient for most of its readers, many do NOT get the idea the first read. For clarification, we need to understand the terminology which I will be using so that you can understand my reasons for using different terms which have in the past been misunderstood as to what was being said. In the following I am going to attempt to talk primarily about five seemingly different types of writing forms. Also mentioning others of which some are believed to be different from the others and they are only different in application (Different Rules, if you will), and different in that they are modified in the manner of different speech. Many will read and read and still it never clicks. To those people, my advice with no offense intended, is to toss in the towel; you were not meant to know. 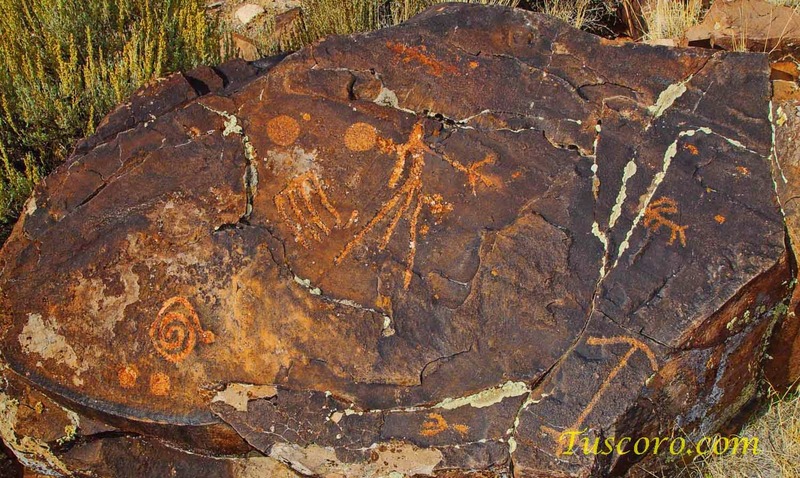 We will be talking about what is primarily referred to as Native American Petroglyphs and Pictographs, including what is believed to be sub groups such as Fremont Style Anasazi Style or Vernal Style when in fact there is no style to speak of. They are the same, differing only in subject and in SOME cases, minor tribal differences (Application) due to perspective or manner of speech. 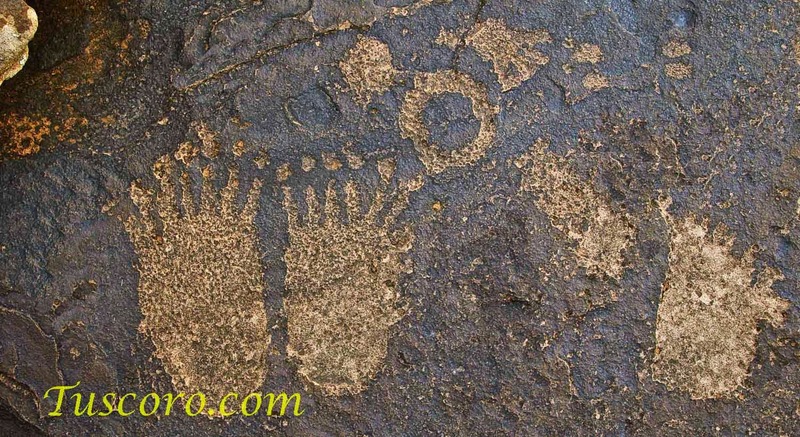 We will discuss what is known as Mystery Glyphs, The Lenape Wallum Olum, the Ojibwa Hieroglyphs and Egyptian and how all of them, including the Native American Petroglyphs, have a common root. The symbol was created from the motions of Hand Sign language but is not limited to; it may also be symbolic of some thing as seen by the eye in its natural appearance or its natural motion. An example might be the symbol for "wooden object" which is identical to the symbol of our alphabet the letter Y. A symbol is to express some concept, action or idea. A hieroglyph such as a Mystery Glyph, Ojibwa Glyph or an Egyptian Glyph is NOT a symbol, it IS a combination of symbols put together to create a sentence or extended meaning of the symbols themselves, NOT a phonic sound. 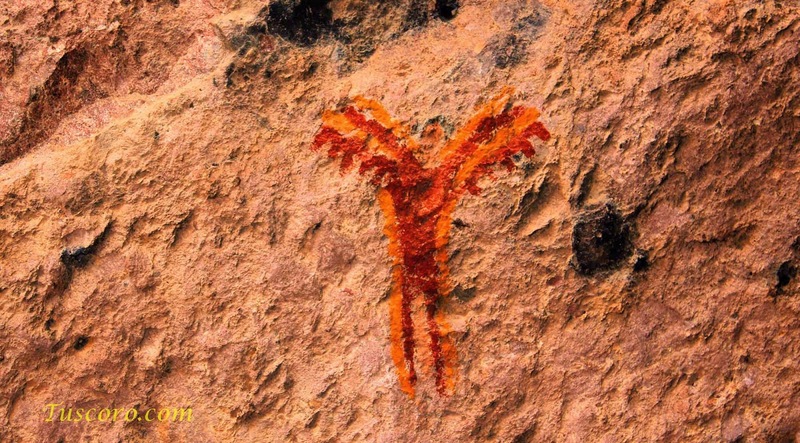 These symbols are of ancient origin and are most likely the very root of all Hieroglyphs. When in history, was the first time that a hand sign language was NEEDED other than the possibility that some where in history we had an overwhelming amount of people in a society that were deaf? In ancient times, these people were generally shunned and no special consideration was given. They didn't have Hillary and Obama to look out for them. The first time a hand sign language would have come into NEED is shortly after the Confusion of Tongues, something had to be done to re-establish some form of communication and this is the very place that I believe this originated. Shortly afterwards, a hand sign language was created. This was the first impulse when two people came together who did not understand each other. This would be your response, unless you are like many who just try speaking slower as if this might help. I believe the hand signing was converted to a system of symbols modeled after the already in place hand sign language. At this time it would make perfect sense to add several other independent symbols to convey any other concept, action or idea which hand sign language could not convey. For this very reason our modern day sign language for the deaf is accompanied with a sign language for the alphabet in order to spell things which cannot be relayed by sign language alone. 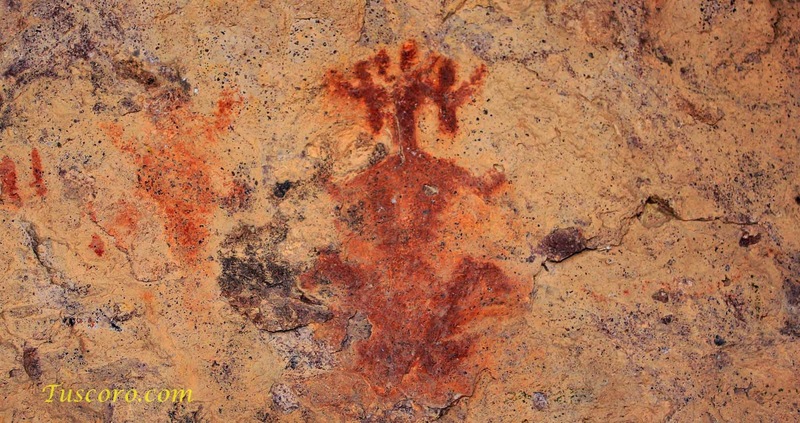 Near everyone is familiar with the fact that no matter what tribe was encountered when the Europeans arrived on this continent, was that most of the Indigenous regardless of where they were found, could understand each other through signing even if one was from the southern most regions of South America, and the other from the great lakes. Now, could they all understand the glyphs? Maybe. 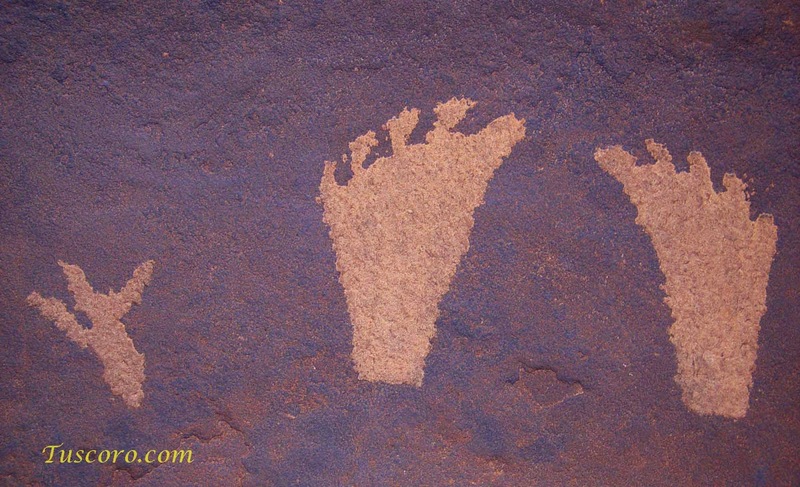 Many years ago when I stumbled across my first petroglyphs, I starred in amazement and wonder... What does this mean? I thought.. 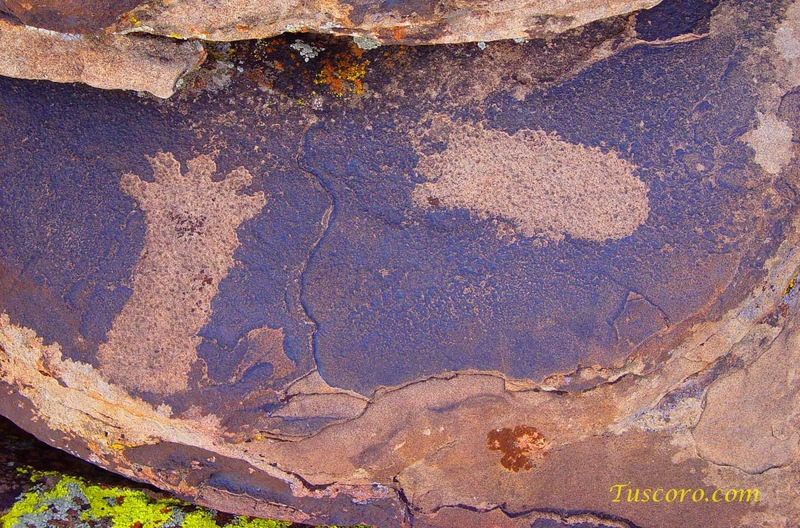 I was so stricken by the panel I found, I just had to know... Years later, after finding the only publication that someone seemed to know something about the meaning of Native American Petroglyphs, and trying to apply the principles in the field, it became more and more apparent that there was something to the Hypothesis of LaVan Martineau. In the following pages I will do my best to bring you up to date concerning my findings in this still hypothesis. In the two following images I am going to give you the translation as simple as it needs to be, the message from the past as to what message was intended by them, and later in this progressive report, I will demonstrate a "breakdown" of the glyphs and explain why I have given the meaning I have... for those of you interested, stay tuned, for the skeptics let me remind you, you have no knowledge to the contrary. It would be like trying to refute the Bible, when you have never opened the pages. There is a tree growing upon a rock and covering it, the tree has been cut off in the middle with two remaining branches which spread wide. The rock it grows upon is a part of a cavern, All of this is hard to see. There is a man made object, made to hold something, from this (side) outcrop, turn left and go down. over the ledges, through the wash (Gully, Rock Incorporation)) to here. 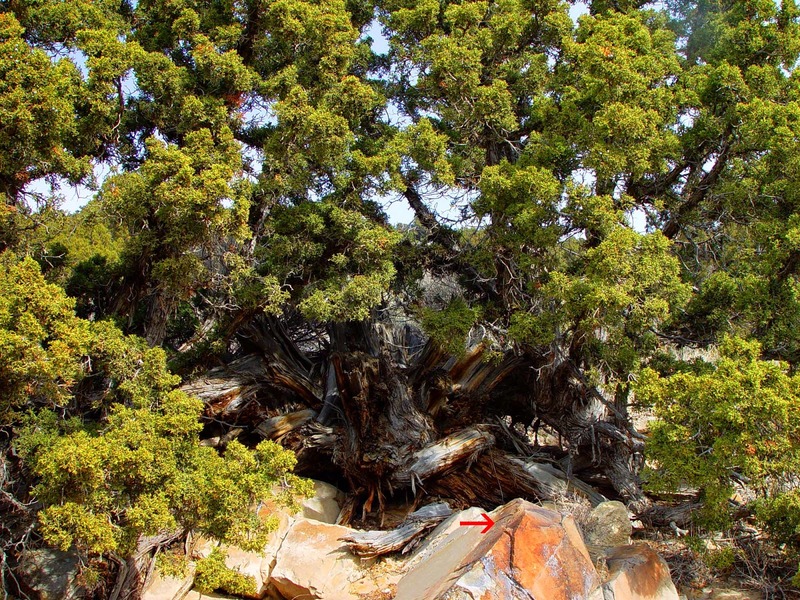 The tree above is the very tree which grows upon a very large rock. Prior to some trimming of the thick overgrowth, you could not see the implications, nor could you even come close to seeing the final glyph indicated by the red arrow. 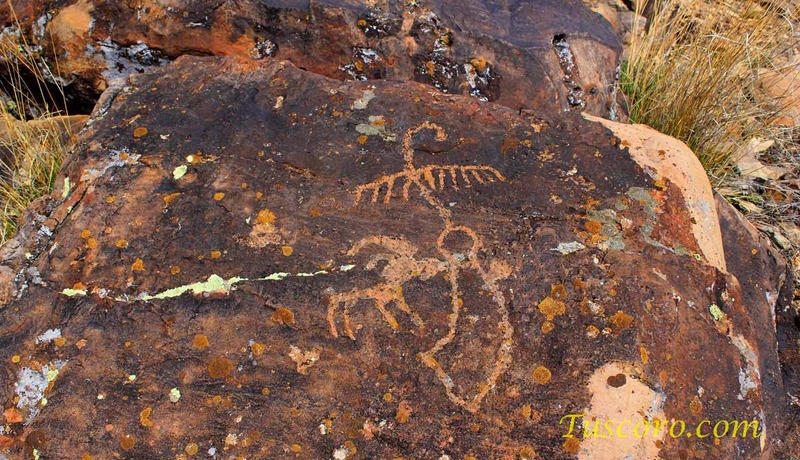 In the following pages I am going to give you a little treatise that I hope will help you to understand the basis of the hypothesis of the Native American Petroglyph, as a written language, according to myself, and LaVan Martineau.